Convert any Video file to Audio file in Mp3 format. Remove Audio from Video(Create Mute Video). Trim Video of any format, size & duration with same quality Output. 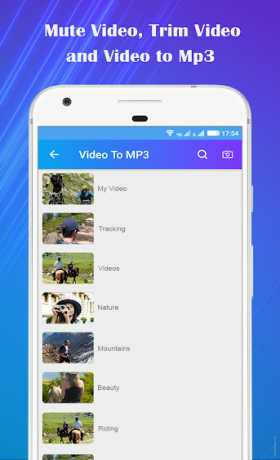 * Convert Video to Mp3 – Extract Audio from Video of any format and save as Mp3 file in your device. * Mute Video- Wanna remove sound from Video? Use this app to Mute Video and remove unwanted Audio from your Video. * Trim Video- Easily select the part of Video you wanna trim and get same quality output Trimmed Video.